Emergency chargers are the latest craze nowadays, and for five years, Proporta has been releasing these in the market. The latest in their Turbocharger range is the ‘Stripe Turbocharger 12000’ with a 12000mAh to fulfill the demands of bigger smartphones. What’s impressive is its size which is a bit thicker and heavier than a Lumia 930. The Stripe Turbocharger is made of rubber and metal in its surface. The metal-effect-plastic are on the edges and the rubberised plastic, convex-edge was added for a maximum grip and an anti-slide effect. It has two output USB ports with mottled shiny plastic around them. One is rated at 1A and the other is 2. 1A plus a 1A for the microUSB input. This means, you need to charge the Turbocharger for overnight (approximately 12 hours) for a fully-charged battery. In operating the Turbocharger, you need to press the ‘on’ button located at its side. On its top surface, there are four LED indicators that will light up blue every time 25% of power has been transferred or used. It also lights when the internal battery of the Turbocharger refills by 25%. Probably the best feature is its charging capacity of 12000mAh which means that it can charge fully multiple devices. Even though there’s a 20% energy loss through the transfer process, the remaining 80% can fully charge a smartphone for up to seven times. 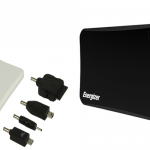 The Turbocharger also accommodates any device which charges using a USB cable. A microUSB lead is also included in the package. When using the relevant cables, phones can be charged using a lower or higher current output. Tablets always need higher current output. 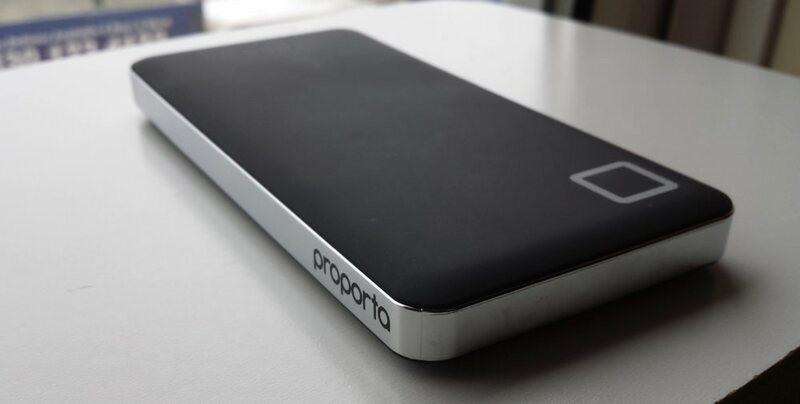 There may be a lot of 12000mAh powerbanks in the market offered in price lower by half of the Proporta Stripe Turbocharger in several sites like Ebay and Amazon. But, for its asking price (£39.95), Proporta Stripe Turbocharger is worth the price as it provides a lifetime warranty for its users. It also has a free shipping fee. It is worth saying that part of the profit will go a long way in helping others as the British company manufacturing it openly supports charitable causes. Also, there are a lot of discounts on this product, offered to those who subscribe in its email newsletters.